Unlike the complicated - and often difficult to understand - set-up procedures required by other hotel management systems, Booxotel's step-by-step "hotel build" process takes the guesswork out of setting up your Booxotel Hospitality Management Suite. At the root of this phase is a Single Staff Build or Multiple Staff Build workflow which ensures that ALL required hotel data has been entered before you start to use your system. Building your hotel in Booxotel involves inputting all of the various information your system needs to accurately and efficiently administer room reservations, rooms and sales outlets. When beginning the build process, you may elect to use one of two Booxotel build workflows: the Single Staff Build or the Multiple Staff Build scenario. Single Staff Builds are typically appropriate for a SINGLE person responsible for entering ALL hotel data. If you have additional hotel staff members to help with detailed process however, a Multiple Staff Build process may be the more efficient option to choose. You may take as long as you like to build your hotel in Booxotel providing you login regularly. Once your hotel has been successfully built - and the Congratulations screen appears - you will have a maximum of 14 days to test your system. After the Booxotel Hospitality Suite has been downloaded to one of your computers, you may begin entering all of the data required for your system to operate. This information will include inputting location and contact information for your hotel, followed by various specifications for each room in your hotel (room type, room number, room detail, room pricing, etc), followed by sales outlet and sales product information, product pricing, and more. When all of the information Booxotel needs has been entered, a Congratulations screen will appear. This screen signifies that you have successfully completed the build process and that you may now begin testing your system for a maximum of 14 days. Multiple Staff Builds is a two-phase process which essentially short-cuts the Single Staff Build workflow. Instead of entering ALL of the information for each one of your rooms and sales outlets, phase one of this scenario requires that you only enter your hotel's location and contact details, a single room type, a single room number, a single room price and a single sales outlet. After this has been accomplished, a Congratulations screen will appear as Booxotel now has the minimum amount of information required to properly initialize all system components. Phase two of the Multiple Staff Build process involves downloading additional copies of YOUR Booxotel system to various computer work stations throughout your hotel. Once this is done, you may delegate the task of inputting the remainder of your data to those staff members responsible for different departments in your hotel. For example, Additional room types, room numbers, room details, and so on, can now be entered by your Rooms Manager; Additional Sales Outlets and sales product line items can be entered by your Retail Outlet Manager; sales item and room pricing can be delegated to the individual managers of your various sales outlets (e.g. Your restaurant manager can input pricing for all restaurant items; your gift shop manager can input pricing for all of your gift shop items, etc.) or your financial staff. Once your staff has completed entering all rooms, room detail, sales outlets, retail products and pricing, you may begin to test your system. It's important to note that once you see the Congratulations screen at the end of phase one of a Multiple Staff Build process, you will have officially entered the 14-day system testing time period. As noted above, you may still enter the rest of your hotel information during this testing period, but each day you take entering additional hotel data, will be one less day you will have for testing. Once you see the Congratulations screen, you will have officially entered the 14-day system test period. This test period has been implemented to ensure that your staff has adequate time to become familiar and comfortable with Booxotel's intuitive and efficient workflow BEFORE you use your system with real customer data. During this period, we would suggest that you test any or all of the components of your system. For example, you can enter as many "test" reservations as you like to see how the reservation and room management modules work. You can also allow "test guests" - as well as "test hotel visitors" - to purchase goods and services from various sales outlets. After any number of testing rounds have been completed to your satisfaction, you can transition from your previous hotel management workflow to your new Booxotel system. 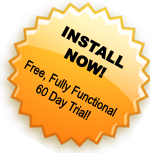 Transitioning to Booxotel will begin your 60-Day Free Trial Period. Your 60-day trial period begins when you start using your Booxotel system with real customer data. The "Start Day" for your 60-day Free Trial Period is flagged in the system the moment you click the "Start 60-Day Free Trial". During this 60-Day period, your Booxotel system is fully functional and free from any fees. On your 61st. day of use, however, the system will begin keeping track of your room occupancy statistics for Booxotel-User billing purposes. As you've already become aware, there are a quite a few event stages to this initial process. To try and make these event stages a little clearer, please reference a sample calendar of event stages shown below. This example will assume that you have downloaded your Booxotel Hospitality Suite on August 14. November 30 - Invoice for payment for past 30-days of System Use issued - payment for occupied rooms is requested within 14 days of invoice. The best way to start using your system with real guest data is to choose a transition day when there are as few guests in your hotel as possible. We will call this transition day your "Start Day". While not required, your Start Day will - ideally - have a minimum number of guests checking out of your hotel as possible. For guests checking in ON or AFTER Start Day: Make a reservation for each arriving guest in your new Booxotel system. Once these guests are in Booxotel, you may delete them from your previous hotel management system. On your Booxotel System, make a reservation for these guests AS IF they are checking in on your Start Day. Once these guests are in your Booxotel system, you should CHECK THEM IN on Start Day. When these guests check out, present them with the invoice prepared in step a. This invoice reflects the days they were in your hotel UP TO Start Day. Then present them with the invoice from Booxotel reflecting the days they were in your hotel FROM Start Day. The total charge will be the sum total of both invoices.